Émile Salomon Wilhelm Herzog (1885-1967) was a distinguished French writer, who wrote in many genres in a writing career that was over sixty years long. He took his pen-name from a village in northeast France which he encountered during the Great War; in 1947 André Maurois became his legal name. As his entry in the Encyclopedia of Science Fiction shows, Maurois wrote a good deal of largely satirical science fiction. His very first work “La dernière histoire du monde” [“The Final History of the World”] (1903) (originally by Émile Herzog) was the first of his several Future Histories. A number of these were later treated by Maurois as “Fragments of Universal History”. One of these is Le chapitre suivant (1927; trans as The Next Chapter: The War Against the Moon, 1928): a group of newspaper barons concoct a war against a supposedly uninhabited Moon to provide an enemy for mankind; but the Moon is inhabited, and fights back. The sequel is “Chapitre CXVIII: La vie des hommes” (translated by Hamish Miles as “The Earth Dwellers”), which with other Fragments of Universal History was collected as Relativisme (1930; translated by Hamish Miles as A Private Universe, 1931). Maurois also wrote Voyage aux pays des Articoles (1927; translated by David Garnett as A Voyage to the Island of the Articoles, 1928), which is a Utopian satire; Le peseur d’âmes (1931; translated by Hamish Miles as The Weigher of Souls, 1931), where a doctor discovers that the life force is a gas which escapes the body at death; and La machine à lire les pensées (1937; translated by James Whitall as The Thought-Reading Machine, 1938), where a scientist discovers how to record thoughts onto photographic film. In 1930 he published a delightful satirical fantasy for children, Patapoufs et Filifers, which was translated into English by Rosemary Benet as Fattypuffs and Thinifers (1940).The first French edition was illustrated by Jean Bruller, who wrote science fiction himself and, under the pseudonym Vercors, published the classic of the French resistance, Le silence de la mer (1942). My family comes from Alsace. My grandfather had a factory at Strasburg, but the war of 1870 compelled him to leave Alsace in order to escape becoming German. He brought his workmen with him, and set up his factory at Elbeuf in Normandy, and was awarded the Legion of Honour for having thus saved a French industry. I was born in Normandy in 1885. In 1902 I passed my license ès lettres with honours, equivalent to your ‘First’ at Oxford. in 1903 I receive the prix d’honneur for Philosophy at the competitive examinations open to all the lycées of France; for this there is no English equivalent. I wished to write, but I was needed at the factory as my father was no longer young, so I gave up my ambitions and spent eight years in business. During this period I married Mlle de Sienkievicz, a daughter of Count C. de Sienkievicz. Then came the war. After the war he continued his writing career. His first wife died in 1924, and he married again. In 1938 he was elected to the prestigious Académie française. At the outbreak of the Second World War he was appointed to a not dissimilar position to that he had held in 1914; he became the French Official Observer attached to the British General Headquarters, and accompanied the British Army to Belgium. On 10 June 1940 he was sent on a mission to London. But the fall of the French Republic and the establishment of the Vichy government ended that. He went to Canada, and thence to the USA. 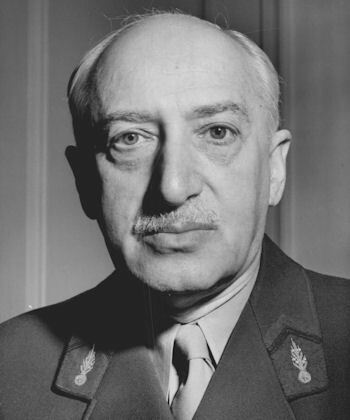 Later in World War II he served in the Free French Forces. He died in 1967 in Neuilly-sur-Seine. Much of the above information comes from Wikipédia.